Outdared hotel, found hair in my bed .... would not recommend this place !! It was better than I anticipated from the reviews. However, it is dated and old-fashioned. The carpets could be replaced. I understand that there are some rooms that are moldy, and that other rooms have been renovated. It might be worth checking with the front desk to ensure a better room. The suite I had ( an unexpected pleasure!) was enormous, with a living room, dining/kitchen area, long hallway with 4 closets, and a huge bedroom with 2 beds. The location is excellent, across from Carnegie Hall, and subways are nearby. I read that the rooms in the back of the bldg are quieter. Nice location. On the web it sad parking charge is $24 they charged me $34 cause I had a minivan. It was DIRTY. The beds were clean but the carpet was nasty, I wore socks all the time. The lighting was dingy, but when all lights were on I didn't want to see the dirt and all. I would NOT sit on the chairs or couch. Great location. No amenities, and internet was not free, and even when I paid for the fast wifi connection, was absolutely terrible. Really, really dated. Big rooms but so old and had worries about whether smoke alarms were working. poor experience. Very cold & didn’t work hit. It was horrible night. Never go their. I liked NOTHING! Lampshade was torn, holes in carpet, mold, used bar soap, broken door locks, desk chair was peeling amd torn. I had to fork put money to book another hotel. We were in New York celebrating my son turning 18, graduating high school and joining the Marines. It was a dream vacation for him and staying at the #Salisburyhotelnewyork was not ok. And shame on Orbitz for suggesting this place and resistance to refunding my money. I took pics and will find a place to post so no one else has to be fooled by this hotel pr Orbitz. The hotel upgraded our room to a suite. A/C in living room didn't work, but bedroom A/C kept both rooms very comfortable. Being able to leave luggage at the hotel after checkout until we finished sightseeing was wonderful! Nick was very helpful with subway routes and other tourist tips! People at the front desk were also very helpful and friendly. This is an excellent location. Very close to Central Park and a few subway stations. We walked to many places our first couple of days, Empire State Building, Grand Central Station, 5th Ave. By day 3 we decided to take the subway. Our wet bar sink didnt work and the couch was less than comfy, but the bed was comfortable and clean, the water was hot and the location was perfect. I like the fact that it is a well-maintained, old-fashioned hotel. For the price, which was so economical for NYC, this hotel was just the ticket. The location was fantastic, so close to the subway and Central Park. Sure everything was outdated but for this price who cares. The bed was super comfortable and the room was clean and quiet and a perfect temperature on a cold day outside. The staff was friendly and professional. Will stay at the Salisbury again. Really can't beat the location. Building is old and worn, but most of important things were good, like clean super soft sheets and bed, a nice hot high pressure shower. Could use vents in bathroom. Staff was super nice and helpful. I would definitely stay here again. Great location. 24 hr grocery store across the street. Easy walk to Times Square, Broadway, Central Park and much more. Would have liked a little workout room. Crack in the ceiling, duct tape on the carpet, bathroom door didn’t close all the way. Not the best room, but okay for one night. Location of the hotel was great. Everything else could be improved. Thank you! The one-bedroom suite is very large. The property is dated & could use a renovation. The Wi-Fi (paid extra) was awful. The people were extremely nice & helpful. Elevators were out our whole stay, so had to use service elevators, which was time consuming at times. The location is great, close to Central Park, Columbus Circle, shopping & sites. 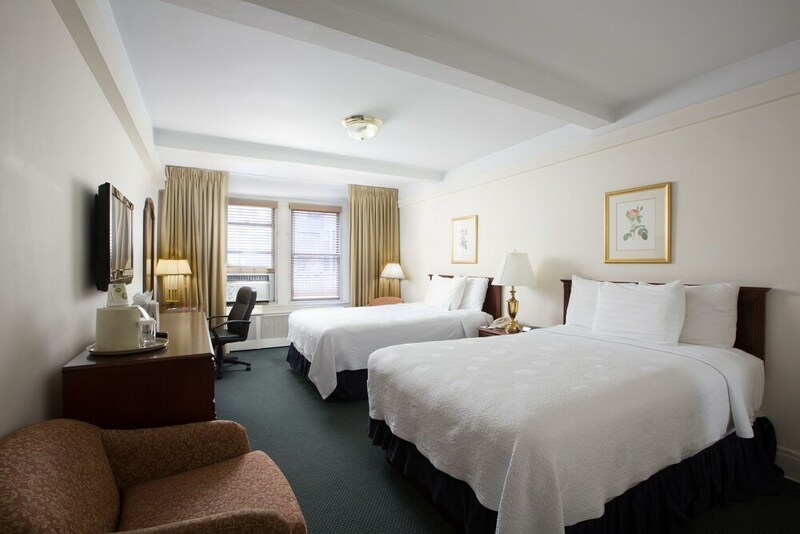 Located in Midtown, Salisbury Hotel is adjacent to Carnegie Hall and within a 5-minute walk of other popular sights like Central Park. This 196-room, 3-star hotel welcomes guests with conveniences like a business center, concierge services, and express check-in. Guests can expect to find WiFi and 32-inch a flat-screen TV with cable channels. The bathroom offers hair dryers and designer toiletries. Other standard amenities include a microwave, a safe, and an ironing board. Guests of Salisbury Hotel enjoy WiFi in public areas, a business center, and express check-in. Self parking is available for USD 24 per night. The 24-hour front desk has multilingual staff ready to assist with concierge services, securing valuables, and dry cleaning/laundry. Additional amenities include express check-out and a porter/bellhop.